The preparations for the completion of our PURE LIVE 2017 are in full swing. 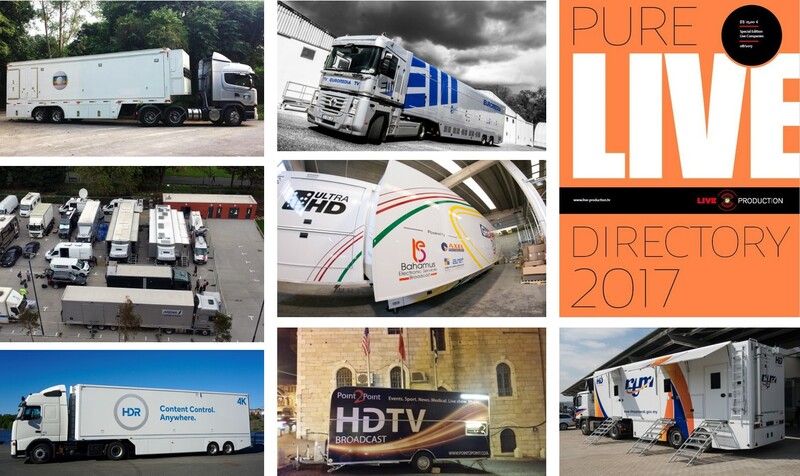 Our annual print directory PURE LIVE will be published prior to IBC at the end of August. In 2017 we will present detailed descriptions of about 20 new HD/UHD OBVans from all around the world: Australia, South Korea, Japan, Malaysia, Ghana, Estonia, Switzerland, Norway, Sweden, Italy, Germany, the UK, France, Brazil and the USA. In addition we present case studies and reports highlighting our areas of focus: video, audio and lighting as well as the latest developments in live sports and live entertainment. You will find stories about the Americas Cup, the Proximus League, the WTA, the MLB, the 24h Nürburgring, the Arcadia Spectakular, Bruno Mars, Ed Sheeran and a visit to Genelec in Finland. Teaming with Slovakian system integrator ELEKTONIKA Broadcast Solutions provided a universal OB Van with the latest technical solutions enabling Televízia Markíza to handle a large variety of productions. A second important purpose the OB Van is dealing with is its use as disaster recovery solution for the studios of the company. An additional novelty in Alphaline OB Vans is the use of Riedel’s MediorNet system as a decentralized signal routing and communications backbone, achieving the flexibility the customer demanded of its OB Van. The resulting OB Van offers the customer TV Markíza maximum flexibility and is a future-proof production tool to be used in the networks own large productions like “Let’s Dance”, as well as in chart-shows or sports events. V__pro8 video processing toolkits as starter, now VSM as next course: Dubai Channels Network (DCN), official media organization of Dubai, trusts in Lawo. The company, comprising a number of print, radio and TV channels under its umbrella, already equipped their Outside Broadcast Division with Lawo’s V__pro8 video processing units for embedding/de-embedding, frame-syncing, color correction and other tasks, thus reducing valuable weight, rack-space and power requirements. In addition, DCN recently ordered the German innovator’s VSM Broadcast Control and Monitoring System for two new OB vans to be installed on redundantly designed servers, providing sophisticated and flexible, IP-based broadcast control and monitoring, integrating management of all on-board and external equipment within a single system. In its role as host broadcaster of the showpiece European club football final, BT Sport deployed XT4K live production servers to power its UHD-4K production workflow. At the same time the servers were used to drive HDR workflows, delivering both higher resolution and dynamic range to create a more engaging viewing experience for millions of fans. The XT4K is the latest in the XT range of EVS live production servers providing BT Sport with up to four channels of UHD-4K in flexible in/out combinations. During the match, the servers were used to ingest twelve UHD-4K camera feeds from around the stadium and BT Sport’s HDR production was enabled by the servers’ 10-bit codec support. The show was recorded in the NEP Studios in Londerzeel with a live audience and was produced by Dedsit. Two interconnected stages were positioned at 90 degrees to one another, with a catwalk in between going out into the audience, which sat each side of the runway and at the back of the room, ensuring the look stayed contemporary, whilst giving everyone a very close-up and personal ‘stand-up’ feel.The set walls were constructed from corrugated wood panels and lit with 322 x integrally mounted 2 metre SGM LT-200 LED graphic tubes. These comprise two sides of 54 LEDs giving a 35 mm pitch, which can be DMX controlled and mapped. They back-lit and highlighted the set highly effectively, setting the tone for the wide range of sketches and skits unfolding on stage. MJ Events was the PA company appointed for the show, and selected the flagship dLive S7000 Surface with DM64 MixRack together with three S5000 and DM48 systems to manage the FOH and monitoring mix. A Waves 3 network card was used for multi-track recording of the 128 channels at 96 khz. Four GigaAce cards were used to split the 128 channels for easy manipulation, and the split enabled the sound engineer to operate the system as two boards, with one board responsible for the orchestra mix and the other handling vocals. Additionally, a ME personal monitoring system, comprising 2 daisy-chained ME-U hubs running 16 ME-1 mixers, provided personal monitoring for the musicians. All the mics, FOH sound system, monitor sound system and in-ears were patched through the dLive system. “We are excited to join the Olympic Movement and integrate Intel’s innovative technologies to advance the Olympics Games experience for fans around the world,” Brian Krzanich, Intel CEO said. “Through this close collaboration with the Olympic family, we will accelerate the adoption of technology for the future of sports on the world’s largest athletic stage”. The Olympic Games offer an unparalleled global platform to showcase what Intel technology can do to transform the future of sport. The first Olympic Games activation will take place at the Olympic Winter Games PyeongChang 2018, in South Korea, in February 2018, where Intel technology will provide real-time virtual reality viewing of the Olympic Winter Games. Entertainment engineering specialist WIcreations specified and fabricated two large and spectacular set pieces – a water fountain and a Tree of Life - for the highly acclaimed Opening and Closing Ceremonies of the 4th Islamic Solidarity Games, a multi-national, multi-sport event staged in Baku, Azerbaijan from 12 to 22 May 2017. WI’s team, project managed by Yves Vervloet, was working for Betty Productions Ltd. who co-ordinated all the creative and technical production elements for the ceremonies on behalf of the Islamic Games Operations Committee. The ceremonies both took place in the 70,000 seater Baku National Stadium, a venue already familiar to the WI team after their ground-breaking work there for the 2015 European Games. In addition to coordinating the fast scenery, prop, and athletic equipment changes in the ‘Golden Age of Hollywood’ musical, PARAMOUR’s stage crew monitored the real-time safety of Cirque de Soleil’s aerial performers; all of whom were working without a net. The Clear-Com intercom equipment was rented by Cirque de Soleil from Masque Sound of East Rutherford, NJ; which has also supported the systems during PARAMOUR’s Broadway run. “PARAMOUR was one of those projects which took Broadway in a new and different direction: It had a story and songs like a musical, but also had a strong component of Cirque du Soleil acrobatics interspersed throughout the piece,” said David Patridge, PARAMOUR’s Associate Sound Designer. Arcadia Spectacular is leaving audiences around the world breathless, offering a unique, immersive multi-media experience featuring fireballs, lasers and aerial performances. Wowing audiences around the world since 2007, and set to appear at Glastonbury 2017, the show’s technical team relies on Clear-Com solutions to ensure constant communication across the wide and extremely loud set. A 50-tonne mechanical spider stands at the heart of a 360 degree immersive arena. It is a fully integrated structure built from repurposed military and industrial hardware, with mechanical moving arms that are rigged for aerial performance as well as a DJ booth suspended above the crowd. Arcadia has developed a trilogy of shows. Among those EVS tools in action at the annual athletics event was the DYVI live video switcher, which was used for the first time in a multisport production. The switcher’s GPU-based architecture enabled users to create tailored content for each discipline, which could be swiftly recalled with the press of a single button. It was this flexibility and the signature reliability that both XMG and the facility’s owners were impressed with during the live production. Diamond League Shanghai was the second of the 14 events which will be hosted by the IAAF in 2017 and saw more than 100 world-class athletes compete in 16 disciplines. Unveiled at NAB 2017, Ki Pro Ultra Plus captures pristine 4K/UltraHD and HD video to standard production codecs including Apple ProRes and Avid DNxHD MXF. Housed in a portable 2RU half-rack, it also offers extensive I/O flexibility and a range of connectivity options from 3G-SDI to HDMI 2.0 and fiber. Users can record four channels of HD simultaneously as ProRes files, each with different compression profiles, to AJA Pak 1000, 512 or 256 SSD media, with eSATA options also available. Additionally, the channels can be displayed on Ki Pro Ultra Plus’ LCD screen as a quad-split during capture for confidence monitoring, which can also be output over HDMI, SDI, fiber, and the device’s web-based UI. Camera 4.4 Update can be downloaded free of charge from the Blackmagic Design website. Once installed, customers can download the Blackmagic Camera Control iPad app from the Apple app store. All URSA Mini Pro cameras feature built in bluetooth connectivity, which until now has not been enabled. The built in bluetooth will allow customers to to send and receive commands from up to 30 feet away. Once the camera is paired with the iPad, customers can remotely power URSA Mini Pro on or off, change all major settings, adjust and add metadata using a digital slate and trigger recording. The Blackmagic Camera Control app is perfect for customers that need to control cameras in hard to reach places such as on cranes, drones, in underwater housings and more. PMU had invited everyone to its stand at Viva Technology 2017 where the drone races were organised between four professional pilots installed in the PMU Lab. 5km away, the Parrot Bebop 2 FPV Quadricopters were operating at the ParisLongchamp racecourse. The races took place on the straight in front of the grandstands over a length of 100 metres, marked out with obstacles to make it as close as possible to the world of horse racing. Each race lasted between 1:30 and 2 minutes. They were broadcasted live on a giant screen at the PMU Lab, and therefore visible to all visitors. UK-based Digital Tree Media started off as a small media company, serving schools and colleges with basic media requirements. It’s grown to provide progressively larger, event-based productions. One project saw the company producing a two-week long, Olympics-style festival of sport, covering multiple competitions in different remote arenas, using an IP workflow – in 2013, long before most others had attempted live video over a LAN. The company is quite familiar with network delivery of high-traffic, live data streams. Digital Tree Media operates CubeCraft Games, the world’s second-largest server for the world’s most popular online video game, with hundreds of millions of players: Minecraft.